Anatomy of Anorexia - Description | W. W. Norton & Company Ltd.
"Invaluable to clinicians, parents, teenagers, and adults who are struggling with anorexia." —Lynn E. Ponton, M.D. Anatomy of Anorexia is a tremendous tool for families: now more than ever, early diagnosis and treatment, and family participation, are crucial in helping the anorexic. Preeminent therapist Steven Levenkron demystifies this life-threatening disease and shows how the millions of girls and women who are afflicted with anorexia can be helped—and can look forward to rich and productive lives. 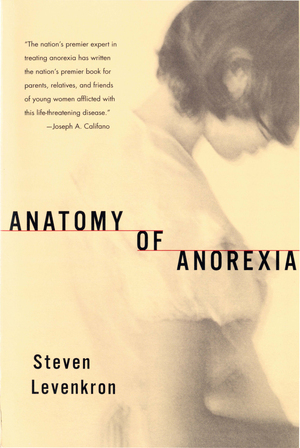 "The nation’s premier expert in treating anorexia has written the nation’s premier book for parents, relatives, and friends of young women afflicted with this life-threatening disease. "—Joseph A. Califano Jr., president of the National Center on Addiction and Substance Abuse at Columbia University and former U.S. Secretary of Health, Education, and Welfare "[Levenkron’s] insights, descriptions of family relationships, and treatment recommendations for therapists create a rich, deep, and most helpful guide for a community of people whose lives are deeply and painfully affected by this persistent illness. "—Samuel C. Klagsbrun, M.D. From the psychotherapist who offered groundbreaking work on self-mutilation, an examination of the psychology of victims of sexual abuse. A seminal work on treating self-mutilation, revised and updated with illuminating case studies and newly available resources.